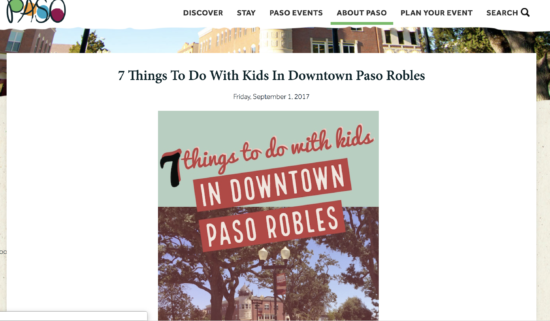 TravelPaso.com, Paso Robles’ official tourism website, featured an abridged version of our original blog post, 7 Things To Do With Kids In Downtown Paso Robles, in its September 2017 issue. Here’s that guest post version as published. I could do oh-so-many posts about how to have fun with kids in Downtown Paso Robles, since this is our home and we’re, you know, here all the time. There are a lot of family-friendly activities for the kids in this town, but for this post I’m going to focus on the seven things I do with my 3 year old during our special weekly one-on-one time. The main part of downtown is situated around four streets that surround Paso Robles Downtown City Park. There are great things to do outside of this main part, of course; but with a 3 year old in tow, I find that sticking to this downtown core keeps things moving. With each of these seven stops, we will take you around the square, ending right back at our car. Our little tradition usually starts around noon in the Paso Robles City Library parking lot at 1000 Spring St. You’re almost always guaranteed a space in this lot during the weekdays, and, as with all of the downtown, parking is free. The library has two restroom locations (one in the City Hall lobby and another inside the library) and a water fountain; so it’s just a good home base when you’re with kids. When you park here, just walk through the south entrance of the library/City Hall toward 11th street and you have made it downtown. BOOM. Easy peasy. We highly recommend eating lunch with kids at the Red Scooter Deli at 1102 Pine Street. After you exit the doors from the library’s breezeway, walk east for about a block on 11th Street and enter the crosswalk. The deli is just to the left of the end of the crosswalk, next to Park Cinemas. Red Scooter has kid menu items for the littles. We’re talkin’ half a sandwich, GoGurt, Goldfish crackers and a drink for $5, which is basically all of the major kid food groups at our house. The deli also has gluten free items for me, and of course, all the delicious gluten-y items the rest of the world enjoys. It also has highchairs and outdoor seating with nice shade umbrellas on the patio, with tables overlooking the downtown scene. It’s a great spot for people watching, which means there’s enough going on for baby/kids to look at so mom and dad might actually have a chance to eat as well. Imagine that! After lunch, we walk directly across the street to the candy store. Just take the same crosswalk you took to get to the deli, but go west on 11th Street, requiring just a few steps of backtracking. You can literally see the candy store from the deli’s patio. The newly named SLO Sweets is located in Paso’s historic bathhouse building at 840 11th Street. The store specializes in hard-to-find classics, an international section and an impressive Jelly Belly assortment. So we get our candies, and pay for them at the register. Then we eat our goodies inside the store, because it has the 1971 classic Willy Wonka & the Chocolate Factory movie playing on an endless loop. To watch it, we either go sit at the little metal table inside or mosey on over to the set of four movie theater seats right in front of the screen (so cool), depending on which is available. After your bellies are filled with all the candies, take the same crosswalk east toward the theater and deli again, this time pass those and walk north on Pine Street one block to 12th Street. On the other side of the street you’ll find Spare Time Used Books & Treasures at 945 12th St., D. There’s just something about a used bookstore, or ANY walk-in bookstore these days, that feels like a special treat. No tablets, no Amazon Prime. Just the good ‘ol fashioned smell of musty pages. Here, you can buy books for cheap and turn them in later for credit toward more books. Plus, I like to think you’re teaching your kids about shopping local and the benefits of shopping second-hand. They have a small shelf of books for very small children at the cashier counter. We picked out two bedtime books. Check out my full blog for my favorite shops to walk through with my daughter! This little house is home to Mr. Santa Claus himself and the Easter Bunny (During the respective seasons. Not at the same time, silly. That would just be weird.) But since the house is a permanent downtown fixture year-round, it serves as a fun little playhouse pit stop. The pint-sized real wood Colonial is complete with a porch and open windows for ample pretend play opportunities. My 3 year old actually remembers visiting the Easter Bunny this year, so she takes egg orders from the window. To cap off our trip, we usually burn off some of that sweet, sweet candy consumption at Downtown City Park. The park, as a whole, is a pretty great place for kids. It has pathways and big stretches of grass, a historical museum, a gazebo, and some cool barn-themed bathrooms. But in 2016, the City replaced the entire City Park Playground with new awesome stuff like a merry-go-round, see-saw and a super cool all-access swing. So that makes the playground extra cool. It has two sections: one for very small children and another for the bigger kids, but both sections basically work for all ages. 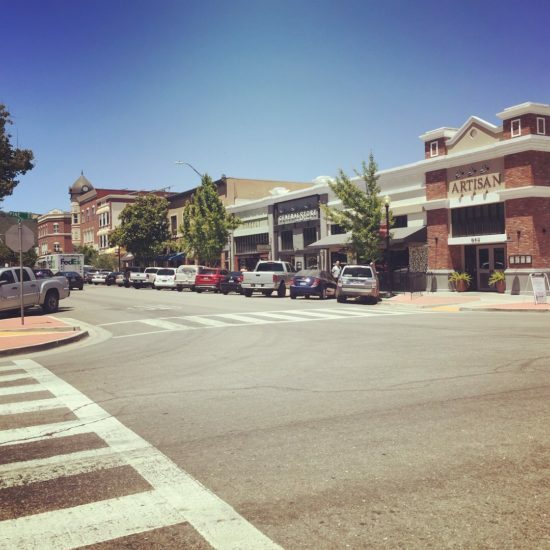 For more tips on family friendly fun in Paso Robles, make sure to check out the Downtown Paso Robles Main Street Association and the Travel Paso tourism website. Hope we gave you some fun ideas for enjoying Downtown Paso Robles with kids. Head to Two in Tow website now to read the full blog!